Mention a celebration brunch and I immediately envision Eggs Benedict with extra Hollandaise... Sticky Buns dripping with caramel... Onion Bagels loaded with Lox and Cream Cheese... Creampuffs... Shrimp and Creamy Cheese Grits... Oh, how that list goes on. This year I aimed for a lighter menu when planning a brunch with friends to welcome Spring. Reality check: Pat prefers healthy meals and Rick is training for an April IronMan triathlon, so I lost any real excuse to get wild and crazy with butter and sugar. Okay, that also meant I would spend less time on last-minute cooking and more time visiting with guests - always a good thing. 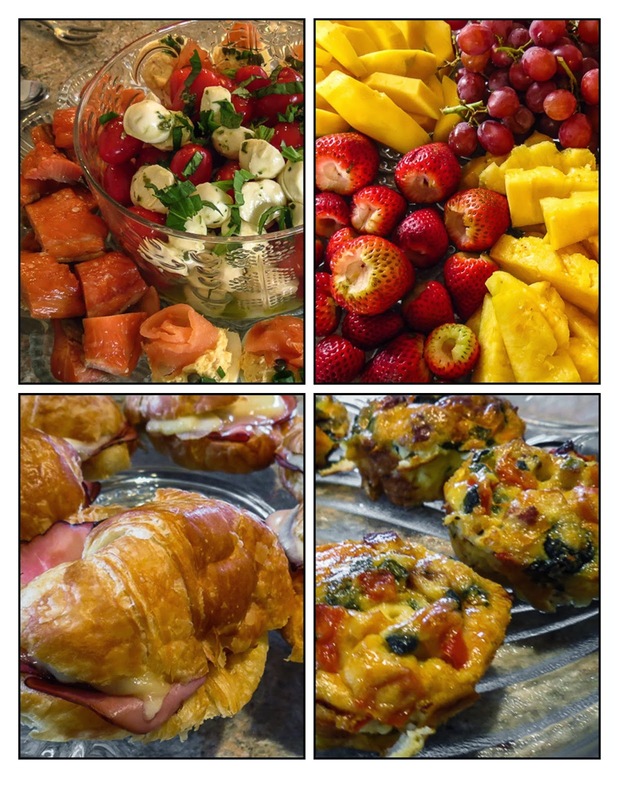 Not that every item was light and low calorie (think ham-and-cheese filled croissant with herb sauce), but the buffet did offer a variety of choices; hopefully something for everyone. Conversation flourished, the hours flew by, and Spring joined the party with a fine display of ever-changing weather. Place all of the yolks in a medium bowl. Add the cream cheese, mayonnaise, lemon juice, lemon zest, dry mustard, sesame seeds, onion powder, and smoked salmon to the yolks. 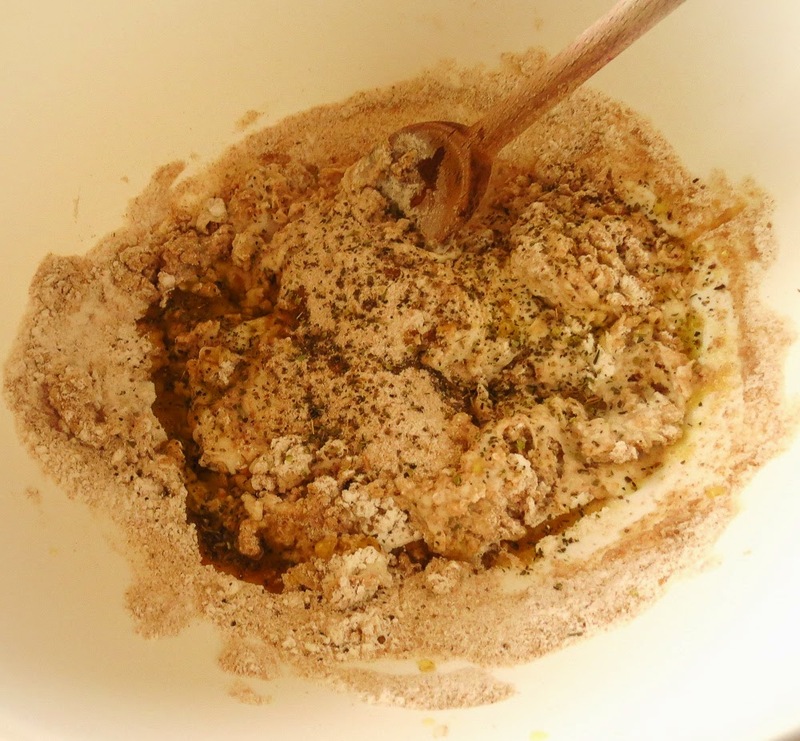 Use a sturdy whisk or a fat fork and combine thoroughly -mash, stir and whip together until thoroughly combined. Season with salt to taste. If you have a steady hand, use a spoon to fill each egg white half. For a more attractive result spoon the filling into a ziplock bag, cut off a corner of the bag and pipe the yolk mixture into the egg white halves. Either way, mount the filling to slightly overstuff each cavity. 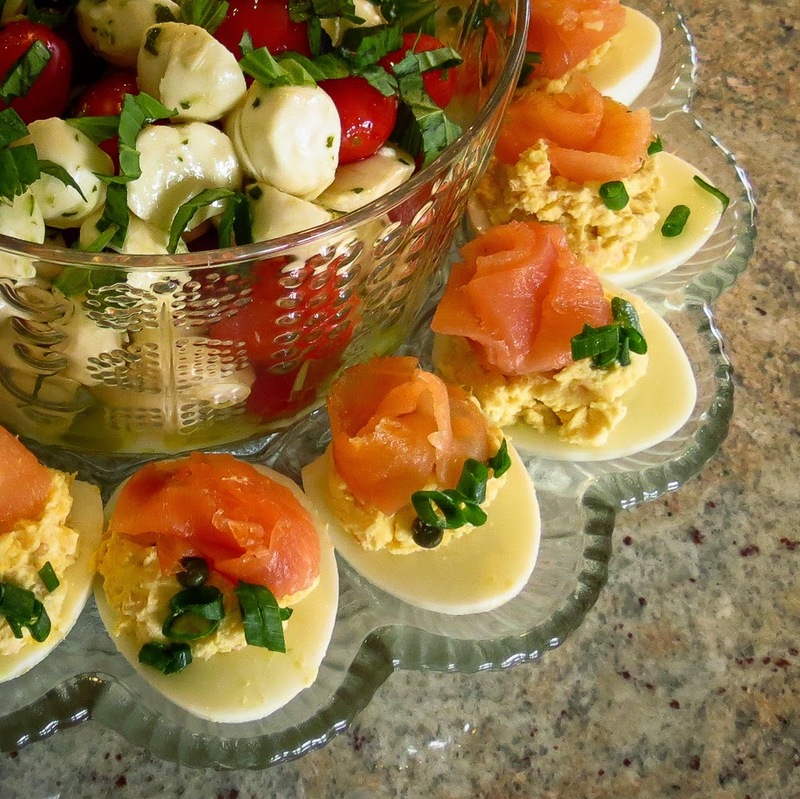 Garnish each deviled egg with sesame seeds, scallion rings, capers and a lox rosette. Serve immediately. Pasta Salad - Plus Peppers and Carrots and Broccoli... oh my! Moving off the boat after a short project-filled few weeks at the dock or following a lengthy cruise, means our meals grow interesting. It reminds me of an episode of the TV show Chopped where cooks prepare a dish from a basket filled with "must-use" ingredients. Thankfully boat cooking is considerably less exotic than the TV challenge. Some days we win with new flavor combinations, on other days the food is just... unusual. The goal is to empty the fridge and freezer in case of a power outage on the dock while we are gone. Most of the assorted bottles and jars that fill the refrigerator door shelves will survive a brief power interruption, but experience has taught me not to leave any meat or seafood in the freezer. Don't ask, it's a marriage-threatening tale. One recent end-of-stay breakfast was a winning combination of apple-filled, syrup-drizzled, sourdough crepes topped with sliced almonds and apple pie-flavored whipped cream. Sigh! what a decadent contrast to a more typical bowl of cereal, yogurt and sliced bananas. Apples are on the traveler's prohibited food list for transport across the US and CDN border in either direction, and I hated to waste the few beauties remaining in our fruit bowl, thus the apple crepes. Fruits with seeds, stone fruits, potatoes and onions, dairy, some meats, etc. are on the list. This list is long and seemingly variable so it's easiest not to carry much uncooked food north or south in order to avoid Custom's delays. But I digress... let's move on to lunch and a tasty, colorful pasta salad packed with vegetables and protein. 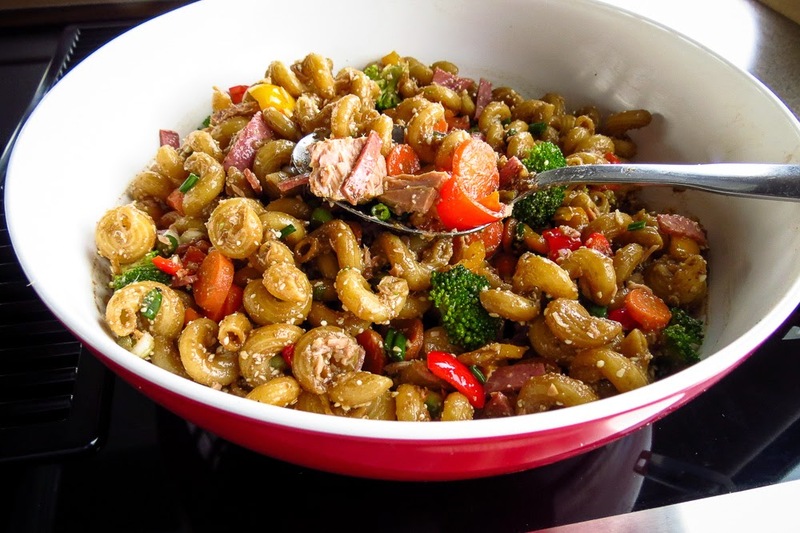 Pasta salad shines as a superstar dish, versatile and ready to embrace a mixed assortment of vegetables, cheeses and occasionally protein. The latest combination was colorful with a rainbow assortment of mini peppers, broccoli and carrots. 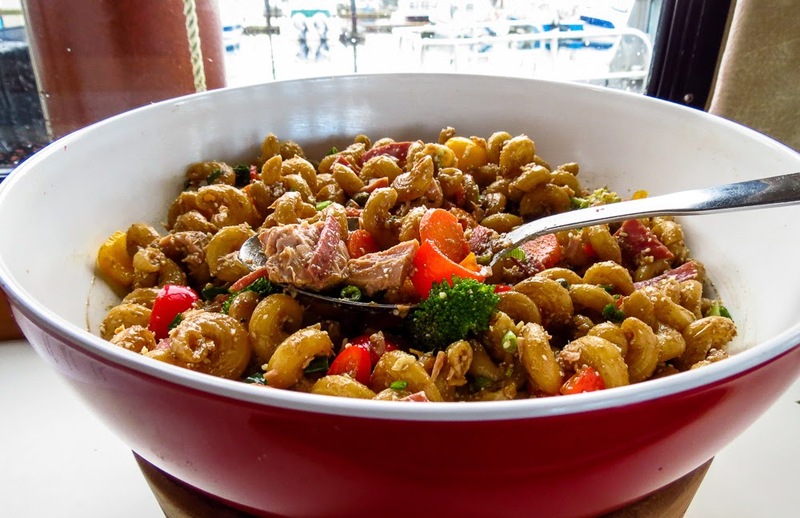 Cavatappi is always a favorite short pasta, its open curls attract other ingredients in a welcoming hug and hold the dressing as well. Cheeses, capers and some protein added more flavor punch and a zesty vinaigrette dressing pulled it all together. The dish served as a hearty lunch for two, plus a generous portion left over for a next-day snack on the southbound ferry. Pasta Salad Plus Peppers and Carrots and Broccoli, oh my! In a large bowl combine the cooled and drained pasta, chopped vegetables, meats and dressing mixture. Toss gently to coat all with the dressing. Let rest for several minutes, then toss again. Taste and adjust seasonings - at this point I usually add some hot sauce and red pepper flakes. Flashback to those early-married, on-a-tight-budget years when we occasionally splurged on a big night out by heading north to the Italian Spaghetti House on Lake City Way. The atmosphere was faux Italian, heavy on trellises with ivy and grape clusters, walls filled with colorful Mediterranean maps and murals, and candles dripping wax down twine-wrapped chianti bottles. The place felt dimly romantic, its dining room dark enough to require a lighter to illuminate the menu. Decades ago, before Olive Garden, Buca, Macaroni Grill, Carrabas or Maggianos came to town, this was our affordable Italian destination. The food? What did we order? maybe spaghetti with meatballs? or lasagna? 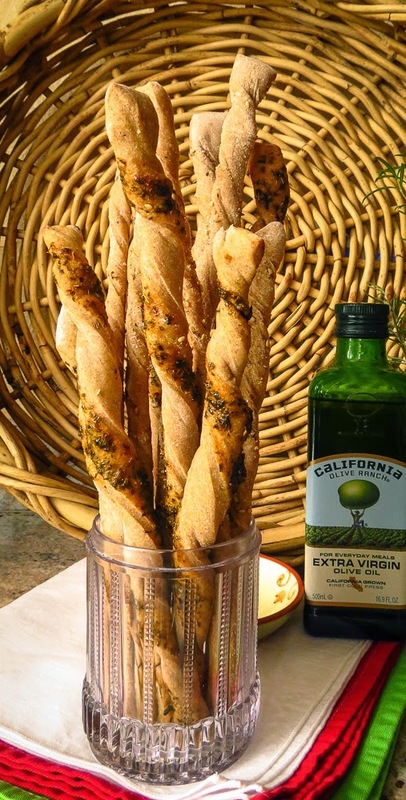 I don't recall much beyond tall glasses filled with cellophane-wrapped grissini and, in later years, baskets of soft, flavorful breadsticks. What was the lure of those dry, crisp packaged grissini? Whatever the attraction, I do remember scarfing up every single one on the table, every time. That was decades ago, the restaurant long since closed and grissini have all but disappeared from food memory. Fast forward to recent months and packaged grissini are visible again, stocked on grocery shelves all over town, at ordinary stores from Albertson's to Trader Joe's. Maybe I have just become more attentive since #TwelveLoaves focused on Italian breads for March 2015, and SourdoughSurprises invited bakers to revisit any of the previous 36 topics for this month's group post, perhaps something previously missed. Hmmm, something Italian plus a sourdough something I haven't baked before... Aha! "grissini!" It's more than time to try a batch in my galley, striving to add a bit more flavor to a homemade sourdough version of those short, crisp bread batons. Combine all ingredients except the toppings and mix well to combine. Let rest for 10 to 15 minutes. Turn out onto a well-floured board and knead until soft and smooth, about 5 to 8 minutes, adding more flour sparingly as needed (note: the dough should remain moist and soft). Place in a greased bowl, cover loosely and let rise for at least 3 hours. 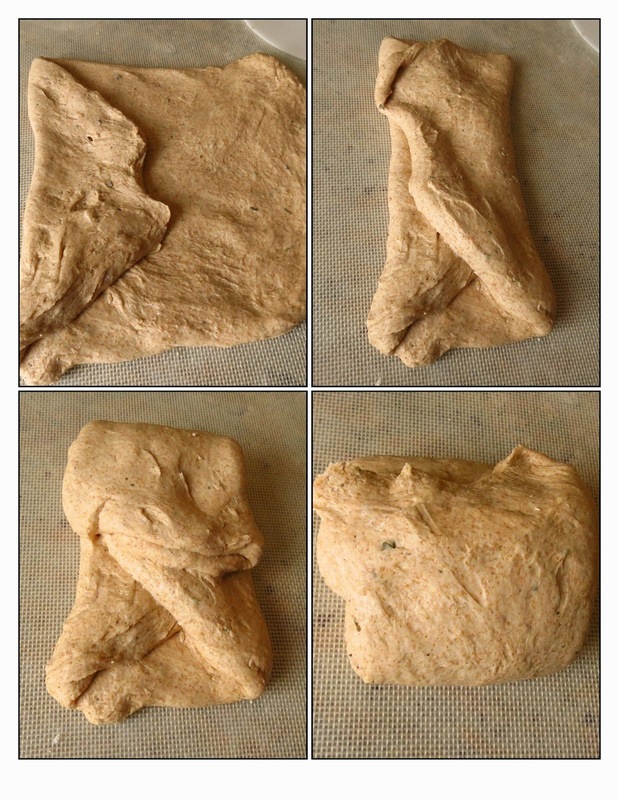 Every hour gently fold and turn the dough to encourage the gluten to stretch. Preheat the oven to 350 degrees F and line 2 baking sheets with parchment or silicone baking sheets (silpats). Roll or press the dough into a rectangle about 1/4 inch thick. Spread with the filling(s) of your choice. 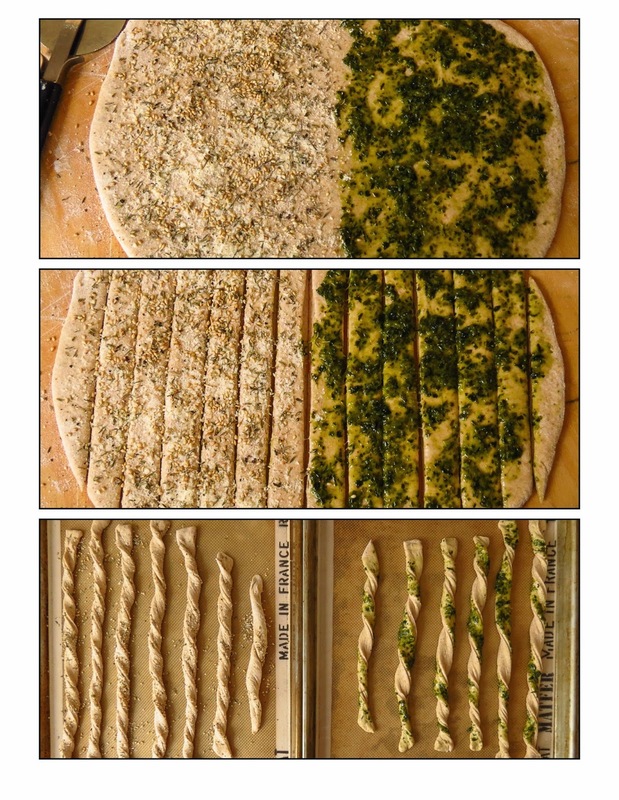 Use a pizza cutter (straight edge optional) to slice the dough crosswise into even strips. Gently twist and stretch each strip; place on the prepared baking sheets and press down the ends to prevent any un-twisting. Place in the preheated oven and bake until lightly browned, about 25-28 minutes depending on the thickness of your dough. Keep a careful watch during the last few minutes; grissini can go from undercooked to burnt very quickly. Cool completely before serving. Taste: The smoked salt flavor was not discernible, adding nothing remotely smoky to the dough, so I'll skip it in the future. Italian Herb paste won top honors as the preferred filling. 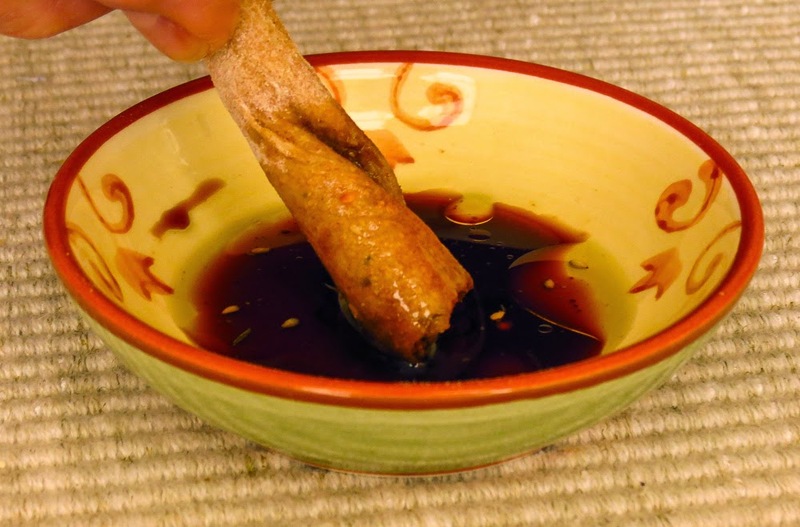 These grissini were especially popular when dipped in a balsamic vinegar and olive oil mix. The z'atar-filled grissini were a disappointment, boring in comparison with the herb paste favorites. However, wrapped in fennel-flavored salami these bland grissini upped their popularity considerably! Texture: Pan A, baked for 28 minutes produced a pleasantly crisp baton, cracker-like in texture, and much preferred over Pan B's softer, almost pizza-crust bite from a 25 minute cook. Pan A went directly into the oven while Pan B rested for 30 minutes. No significant rise or oven spring was noted for either pan; these grissini were crisp and chewy, not light and airy. I might roll the dough thicker next time to see how/if it impacts the texture, or try an overnight first rise, or even add a bit of commercial yeast for comparison. Appearance: Visuals do matter! 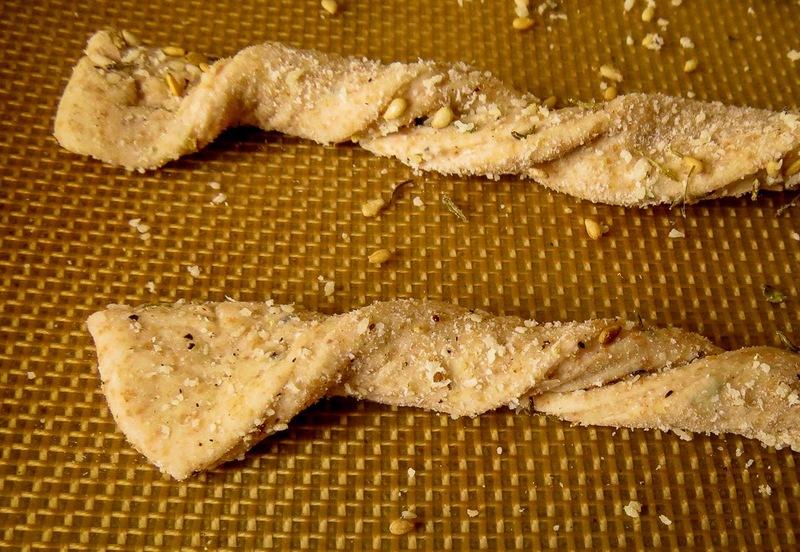 I love the twisted version of these grissini rather than the smooth breadstick log of memory. The herb paste's vibrant green color pop set my taste buds tingling even before the first bite, and it really delivered on flavor. Sesame seeds in the za-atar filling shyly hinted at a flavor treat, but failed to deliver. This filling was upstaged by the herb paste in both appearance and taste. This surprised me since za'atar has been a hit as a focaccia dough ingredient; evidently it loses flavor impact when scattered on top. Today's small trial batch worked for an afternoon snack, but I'll make a double recipe soon. 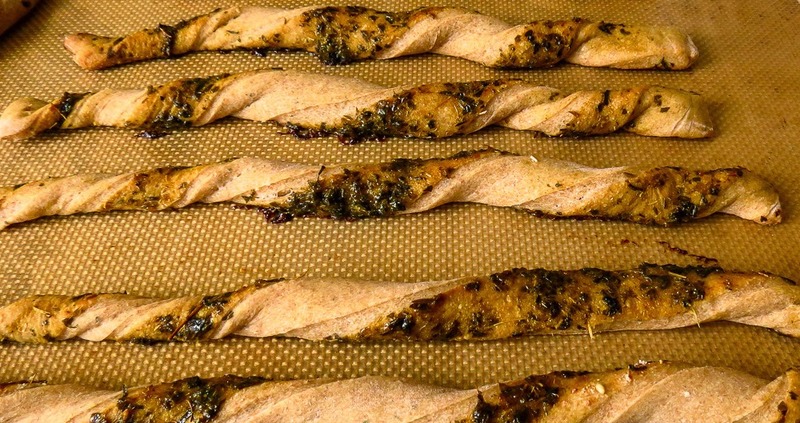 Grissini are tempting as a standalone item, but will really shine when paired with a bowl of soup, something hearty like Tuscan White Bean Soup or Italian Mushroom Soup or maybe Minestrone. Some things never change - I'll still want to scarf up every grissini on the table! No two weeks have been the same recently as we move between house and boat, back to the house and then the boat again... This year's mild winter weather encouraged us to haul the boat early for its annual inspection and bottom paint. Unlike some previous years (link) we were in and out of the boatyard in near-record time (for us). Living aboard in a small space means many items serve multiple uses. In my galley the countertops do dual duty, typically used for food prep and a quick meal, occasionally serving as a convenient workbench or temporary storage location. Today it's hard hat and knee pads, yesterday it was an assortment of tools, screws and parts. 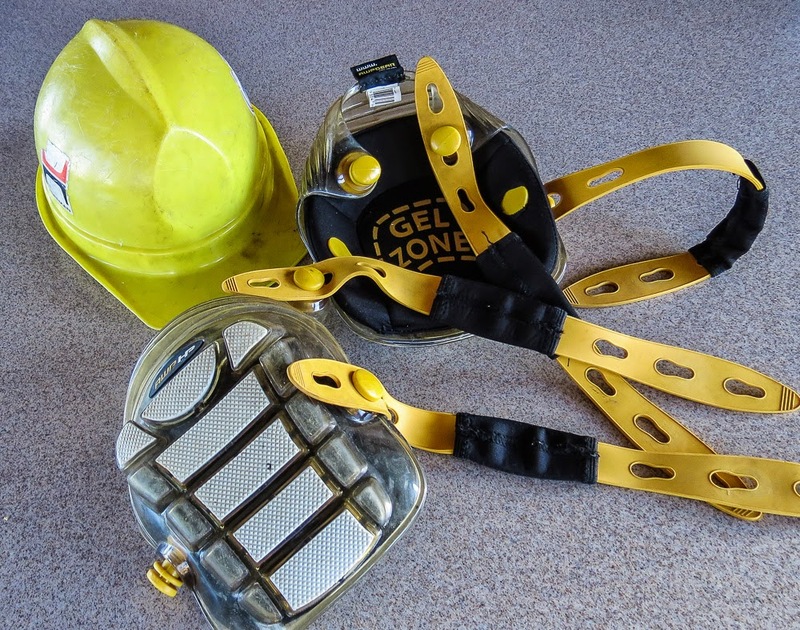 Yes, (because I know you are curious), the hard hat and knee pads are useful items to have on board for RL's frequent projects in the engine room. Last month I shared a photo of the cardboard box holding a replacement cooktop, one that sadly didn't fit in the existing under-counter cabinet space. Fast forward to the latest cardboard box holding a different cooktop, one that will be installed in my galley next week... unless it requires some countertop modifications. Lately cooking in my galley has focused on quick meals and familiar recipes, nothing new and noteworthy. 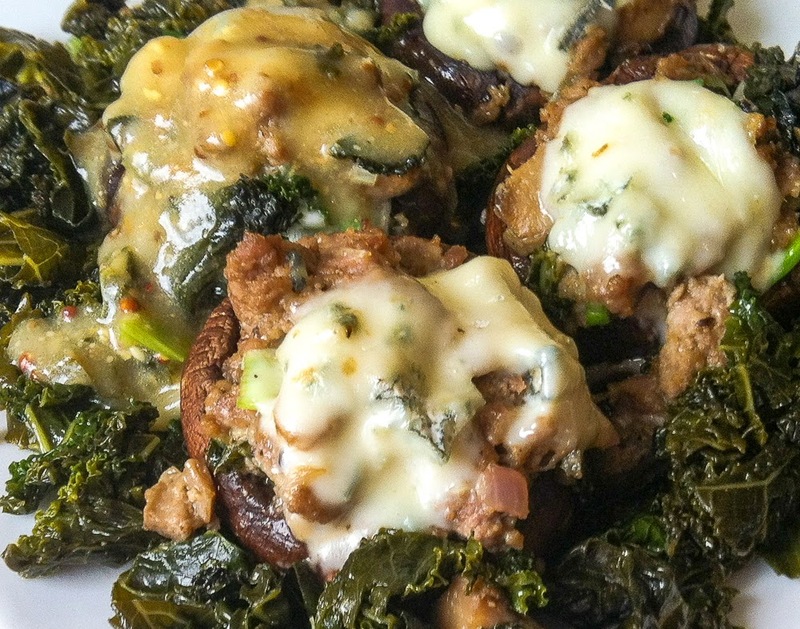 Lamb-stuffed mushrooms with braised kale were a hit, and a practical way to use up bits and pieces in the fridge. There has been very little baking in my galley this month, the sourdough used solely for morning waffles. One batch of Lemon Poppyseed Muffins that I baked to share with the boatyard crew never made it out the door. The taste was all right, but the texture was strange, gummy actually, not something to share. Sigh! there's a reason that package mixes have an expiration date. That box mix from the emergency stores was definitely past its prime. Who needs to bake when fresh baked goods appear with visitors? 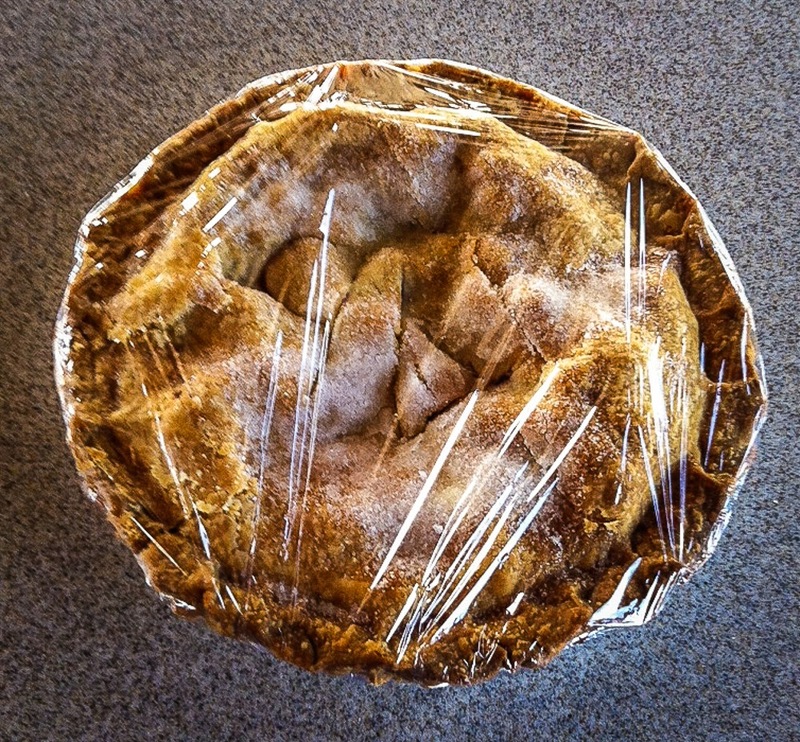 This gorgeous pie arrived with new acquaintance, Dr. Claude, when he came by for a visit and boat tour. In my galley most dishware is made of practical Corelle or some other durable material. 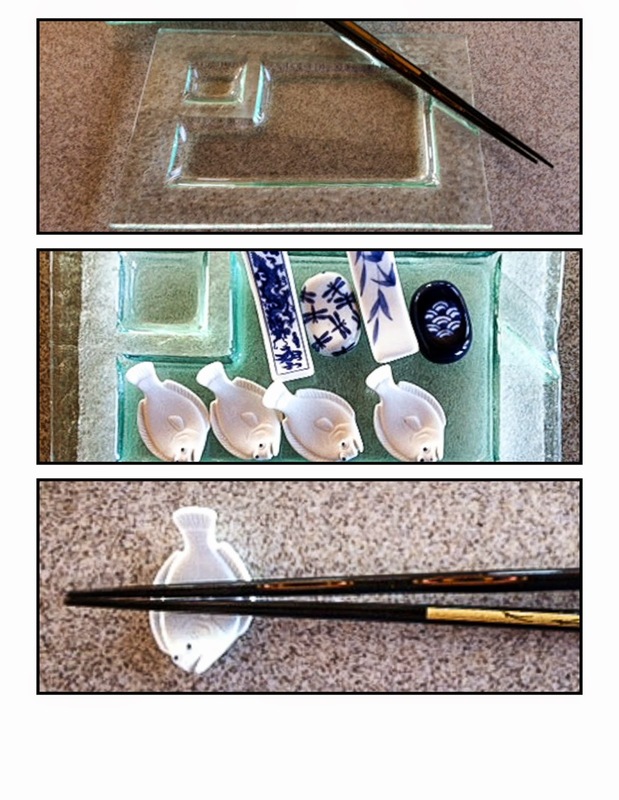 Four lovely glass sushi plates are a welcome exception. A gift from friend Rose, they hold desserts and appetizers as often as sushi. In between uses they stow away carefully swathed in plastic bubblewap to soften the ride in lumpy weather. The chopstick rests are more decorative than everyday practical, seeing occasional service as knife rests, photo props or table decorations. Full disclosure: I use chopsticks to eat popcorn and tend to use my fingers to eat sushi. Today technology is not my friend. The onboard printer refuses to connect with my laptop. The computer won't recognize the card reader. Most boatyard photos were lost when the SD card came apart. While they may be fuzzy, at least these iPhone shots loaded for this post. I think it's time to relax and enjoy a slice or two of that beautiful pie while I watch the sun go down. Then I will kick back and enjoy an online visit to other cooks' kitchens via Celia's monthly In My Kitchen series. Take a few minutes and browse through posts from kitchens around the world; you will meet some interesting people there.